Sitting here in deepest rural Spain, it is easy for Andrew and I to feel a sense of relief that we are, geographically, removed from some of the horrors that prevail as we approach the end of what has been, by most standards, a pretty grim year. Our daily social media fixes are filled with accounts of the atrocities in Aleppo, Ankara, the Yemen and then, today, we read of another attack on innocent people in Berlin; people presumably enjoying the run-up to Christmas. It is easy to feel that sense of relief that we are not tuned in to 24 hours of news every day, where we would be bombarded with images, commentary, speculation and suitably sombre statements from our politicians. But, rural Spain is not without its own recent bloody history, and this has been brought home to us just recently. In the valley where we live, just beside a bridge over a barranco, or gorge, there is a statue of a headless woman, and every day we drive past this statue with little thought as to why it is here or what it represents. We learned the other week that the statue is symbolic of the women who waited for their husbands to return home, but never did, during the Spanish Civil War (1936-1939) or, indeed, a long time afterwards. The Lecrin Valley, for all its breathtaking beauty, is a place with a history that doesn’t much get spoken of. I read this evening a report from 2008 on a mass grave in Orgiva, in La Alpujarra, believed to be the largest such grave in Spain, and one of 50 such mass graves that have been discovered in Andalusia alone. During the Civil War, and afterwards, villagers believed to be supporters of the former Republican government were taken to areas in the countryside, shot and thrown into graves or ravines. As the graves around Orgiva filled up, bodies were transported here, to the beautiful Lecrin Valley, to be disposed of. At a village level, this ‘witch-hunt’ was exacerbated by the added incentive that whistleblowers who revealed possible Republican supporters could acquire their property. It is therefore understandable that there was, for decades, a deeply embedded distrust, and the Law of Historical Memory, passed in 2007, was seen by many as legislation that was to open up wounds that were still very raw. The distrust prevails today, a seeping sore that will, I imagine, take generations to cure. As someone who went to school in Northern Ireland before the end of the Troubles, I saw at first hand the damage done by the indoctrination of hate passed down through generations, based there on distrust of opposing religions. 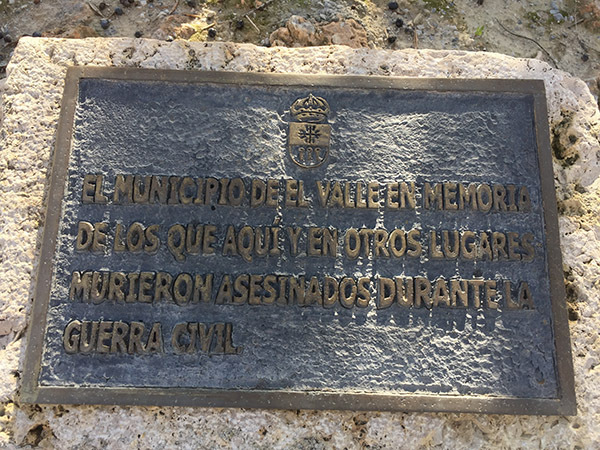 The town of El Valle remembers those here and in other places who were killed during the Civil War. It is sad that the world is such a complicated place, and that hate can and does boil over into manifestations of the worst kind. As we were about to leave the UK to come and live in Spain, I genuinely didn’t like what I saw happening in my own country following the Brexit referendum: xenophobia allowed to surface with a strident voice, as it was felt that the referendum result had given the green light to utter sentiments that are abhorrent. Worse still, this apparent licence leaked out to any other sector of the population who had some deep-seated grudge against another sector, not just race. So, I sit here, listening to Christmas Carols in a house in rural Spain, where the world does seem one step removed, and I am genuinely thankful to be here, despite its own hushed dark cloak of distrust within its own people. We, none of us, know what 2017 will bring, either for the UK or as a result of the unimaginable strife enacted every day in Syria, Turkey, the Yemen and elsewhere, but I suppose we have to live in the hope that, sooner or later, sense will prevail. On that cheery note, I am off to scoff an Oreo and have a cup of tea. By the way, if you want to listen to my beautiful Christmas Carol collection, as mentioned above, you can on The Wireless on Christmas Day!